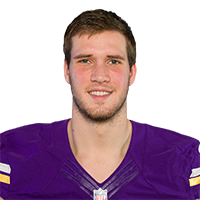 Published: Aug. 30, 2018 at 10:48 p.m.
Minnesota Vikings quarterback Kyle Sloter finds Minnesota Vikings wide receiver Brandon Zylstra by the pylons for a 24-yard touchdown. Published: Aug. 24, 2018 at 11:18 p.m. Published: Aug. 12, 2018 at 12:06 a.m.
Minnesota Vikings quarterback Kyle Sloter rushes 14 yards for a touchdown.